This year saw the Burns Supper held in Carnoustie. A small party from Maule travelled to Carnoustie, arriving on the Thursday before. Most of the party made their way here by car with some arriving earlier and staying on after the event to see a bit more of the area. On Friday a visit to Dundee was on the cards. First stop was the Botanical Gardens where lunch was taken followed by a tour of the glass houses. This was followed by a spot of retail therapy which always goes down well. Later in the afternoon it was off to the Mills Observatory on Balgay Hill where although it was too cloudy for the telescope a guided tour of the planetarium was enjoyed by all. Then back to Carnoustie for an enjoyable meal and evening in a local hotel where they were joined by other members of the CTA. 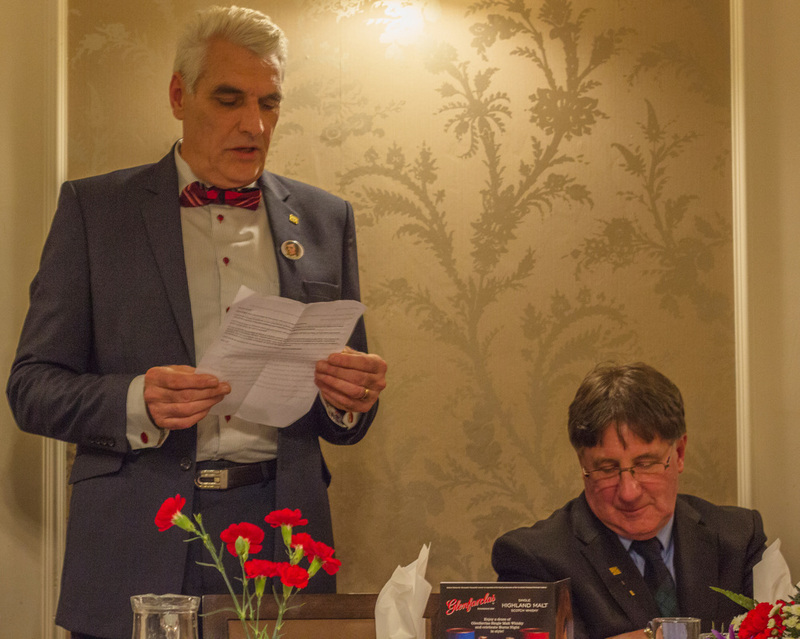 Saturday was a day with hosts and then the Burns Supper which was held at the Station Hotel. A warm welcome was given to all by Roger Jeffrey the Chairman of the CTA and also by Michel Contet Chairman of the Maule Twinning. The picture above shows Michel in full flow with Roger listening intently. During his address Michel told the company that each year the Maule Committee awards the 'Jessie Oswald Memorial Quaich' - which was presented by the family of the late Jessie Oswald to the CJMVM - to a person who has put a great deal of effort into the twinning process. This year they have given the award to Max Fordyce who was presented with the quaich to great applause. The Selkirk Grace was then given by Max Fordyce and the haggis piped in by Craig Weir. This was then addressed by Jennifer Christie and the traditional fare of haggis, neeps and tatties served. Following the meal John Knox gave a lively presentation of the "Lassies of Burns Life' which incorporated the toast to the lassies. The reply was made by Gladys Peat and 'Tam O'Shanter' given expertly by Jennifer Christie. The final piece was 'Kate O'Shanter' delivered by Gladys Peat and then followed the dancing to the Traditionals. A very lively and enjoyable evening. The picture on the left above shows Michel watching Jennifer Christie address the haggis and the picture on the right shows the dancing in full flow. On Sunday it was again time with hosts and friends and also a joint committee meeting to plan ahead. Most of the party returned to France on the Monday. We next meet in April when Carnoustie goes to Maule.